Let’s face it: marketing automation tracks a lot of data, from open rates, to click-through rates, to unsubscribe rates. There are plenty more metrics that marketing automation tracks, but for some digital marketers, all that data can be more overwhelming than actually helpful. If you find yourself drowning in a sea of data, never fear. 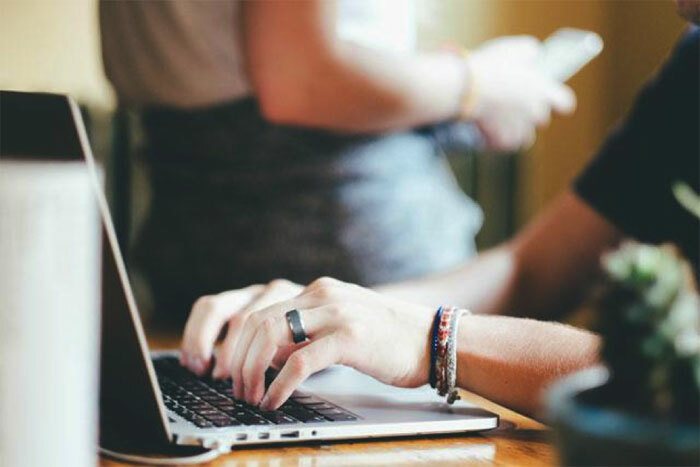 Here are the five email marketing metrics you should be tracking and how you can make the most of the data you receive. Email clients affect how people read and look at emails. Gmail, Microsoft Outlook, Yahoo! and other clients group and display their messages differently. If you know how most of your subscribers are viewing your emails, then you can better design emails that will be more eye-catching to the average subscriber. Knowing whether or not email clients allow for quick image previews or where the subject lines cut off can also be vital to your design. If you know that Gmail, for example, cuts off its subject lines at the 50 character mark and most of your subscribers are using Gmail, then you’ll know to plan accordingly and keep your headline under 50 characters. This will also help you further segment your audience and design the same content in a number of ways. Of course, it would be maddening to try and accommodate every type of email client, but if you focus your efforts on your most common clients, then you will be able to design stronger emails. You look at your total-opens-to-date metric and feel satisfied. Twelve hours after you’ve launched an email campaign, and you already have 1,200 total opens to date. Looks great, right? The real number you should be concentrating on is actually the unique opens. The total-opens-to-date rate calculates the number of times an email was opened in general. If a subscriber opened the email, closed the browser and then opened the email again later, the rate counts it as two opens when it was really done by the same subscriber. This rate, while useful, can be a bit misleading, so remember to look to the unique open rate. The unique open rate will tell you have many subscribers actually opened the email. It won’t record subsequent openings by the same person, and it will show you how many people are actually opening your emails. 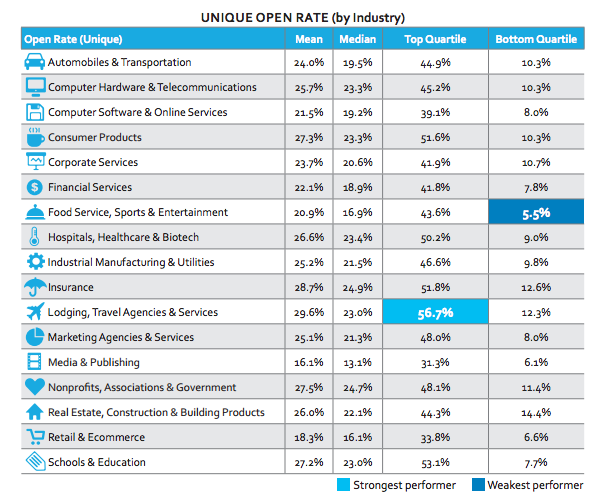 Here is an overview of average open rates per industry. When was the last time you went through and cleaned your subscriber list? How many of those email addresses are still monitored by active users and how many of those have been shut down. If you’ve ever bought an email list (hopefully not), then how many of those subscribers were actually real? When an email is sent to an address that no longer exists, it bounces and is reflected in the bounced email rate. People change email addresses all the time, so it’s not uncommon to see email subscribers come and go, but if your bounce rate is unusually high, then it may be time to go through your list and do some serious cleaning. Most bounce rates will sit at about two to three percent of a subscriber list, so if your rate is much higher than that, then you have some problems. If you’ve previously bought email lists, don’t sweat it. We all make mistakes. Now concentrate your efforts on building a genuine email subscriber list that will show a low bounce rate and improved database marketing. Your email is flooded with different links – from social media links to links back to a landing page or even your website. If you want to know how many people are clicking these different links, check out this rate and see how you can improve your rates. Low link clicks could be an indication of too much going on, you might be killing your email design. When subscribers want to click everywhere or feel pulled to click in multiple directions, they sometimes choose not to click anything at all. Certain metrics will also break down not only the links clicked by also who was clicking them. This will help you gauge how successful certain aspects of your email marketing campaign are. For example, if you have a lot of subscribers clicking over to your sales and promotions, you can better target those users by showing them other great promotions and sales that you will be running in the near future. If some of your links are being missed or overlooked, then it may be time to rethink your strategy for promoting those links. 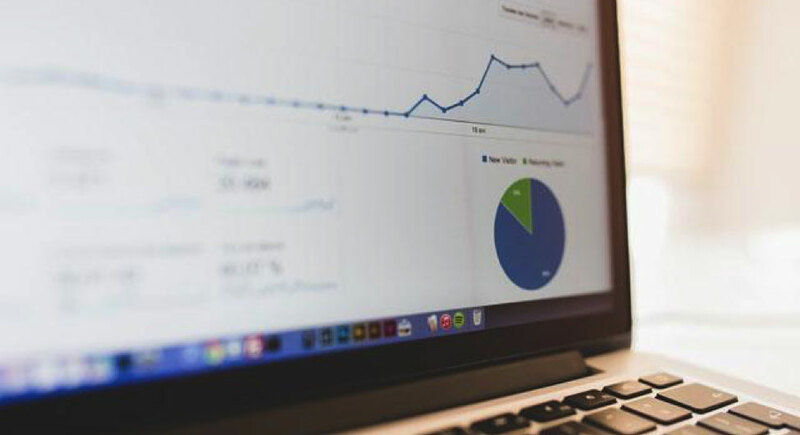 Perhaps one of the most important metrics to track, your conversion rate will tell you how successful your campaign was at achieving its overall goal. If you wanted to get users to sign up for a webinar or provide more information about their companies, your conversion rate will show you how many subscribers actually went through the whole process. When you track your conversion rate over a longer period of time, you’ll get a clearer picture of what type of content your audience is responding to. By looking at multiple campaigns, you can look for patterns that show what users liked and perhaps what they didn’t. In your future campaigns, you can use this information to better design your campaigns. Mike Bird is a co-founder of digital marketing agency, Social Garden. Social Garden specialises in data-driven lead generation & marketing automation to grow companies’ revenue in the finance, property and education verticals in Australia. Mike is an influencer in the social media marketing & Facebook advertising space and contributes to Social Media Examiner, Social Media Today, Yahoo! Business Advisor and most importantly, the Social Garden blog.